Like it or not Christmas is on its way. 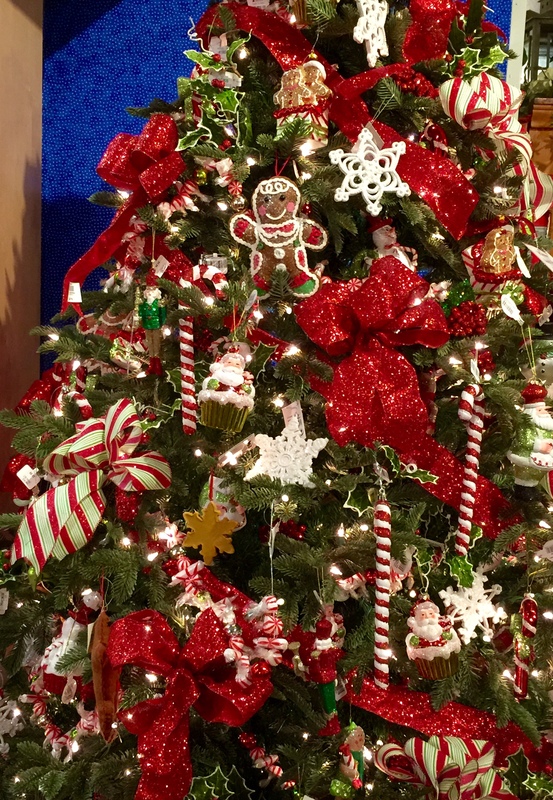 Said but true – the costumes haven’t been worn yet, the trick or treating hasn’t commenced, nor is Halloween even done or behind us and still everywhere you go you will see some sign that Christmas and the holiday season isn’t far behind either. So, as we are gearing up for this holiday, of course, I have had to start Christmas shopping. With two young girls, their lists were started months ago, plus I have other family and friends that I have on my own list, as well. My Girls Are Indeed Getting Ready for Christmas! Well, as luck would have it, Christmas has come early and was allowed to review and keep two different Lalaloopsy toys, which were already on their above mentioned Christmas wish-lists. I, totally unpacked and wrote this review while my munchkins were in school, because these are getting packed away for Santa to indeed bring in about 2 short months now!! What did we get from Lalaloopsy? This one even excited me as I do love to bake (so do my girls) and cannot wait to try this with my girls, as it bakes real yummy treats in minutes! 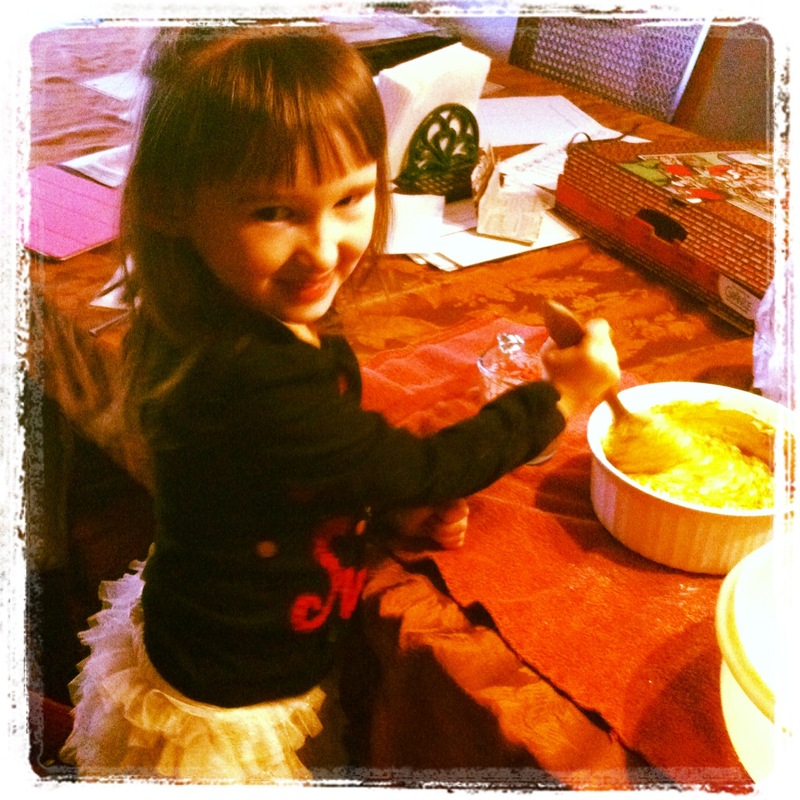 Emma Loves to Bake…Mixing Up Cookies! 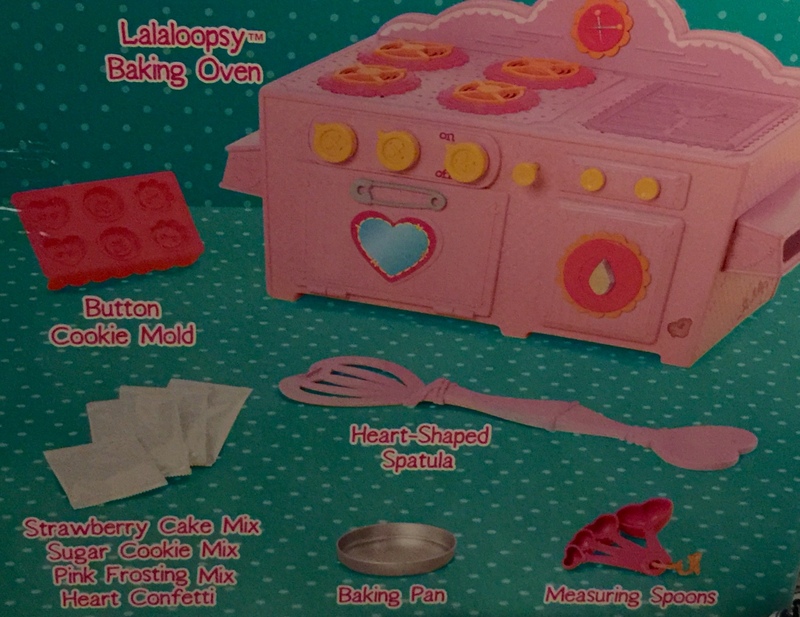 What is included with the Lalaloopsy Baking Oven? By the way, once you finish the included mixes, Lalaoopsy also has refills that can be purchased including Chocolate & Strawberry Cake, Confetti Cake, Chocolate Chip or Sugar Cookies. So the baking fun never has to really end! First of all, my girls have a few Lalaloopsy Dolls and absolutely love them, but what makes this new doll so special is the fact that they can actually decorate and redecorate over and over this doll to their liking. 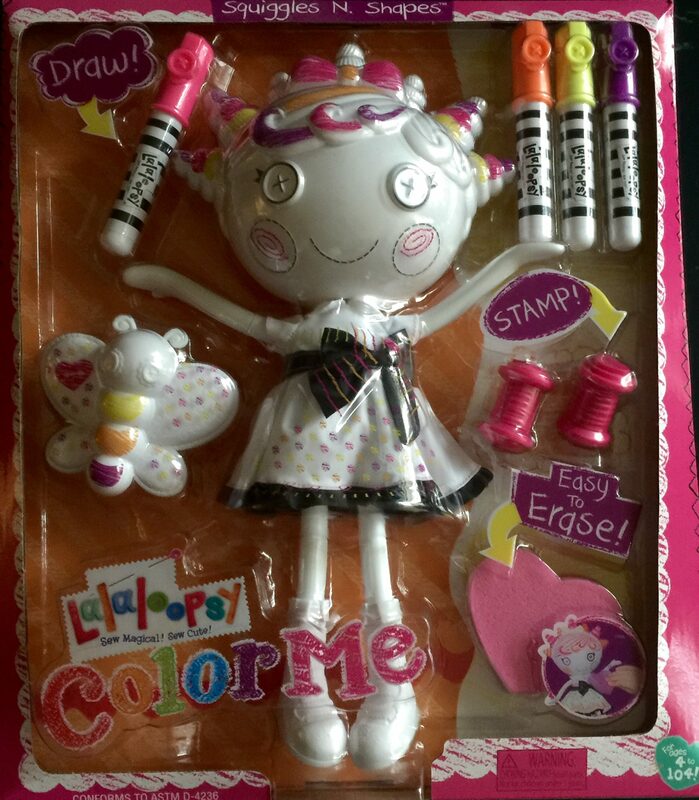 See the Lalaloopsy Color Me Doll comes with three markers, two stamps and even an eraser, so that the girls can draw and stamp on Lalaloopsy Color Me Doll, but then can erase easily to do it all over again. Coming from a mom, who has a kids, especially Emma that I just shared here (take a look at the above picture if you missed this) that likes to draw and decorate my walls, I loved that she could play with this doll and channel her artistic and creative abilities on the doll versus on my walls. Draw, Stamp, and Erase to Do All Over Again!! Don’t believe me how incredible the Lalaloopsy Color Me Doll is?? 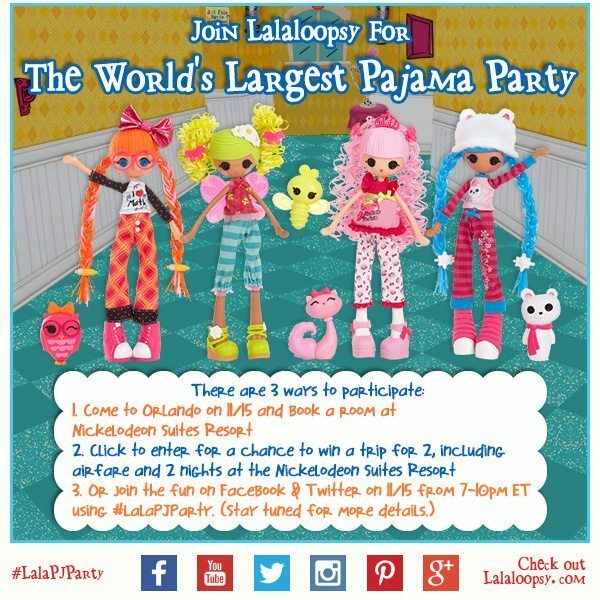 Lalaloopsy World’s Biggest Pajama Party. They are going to attempt to break the official Guinness World Record for most slumber party participants in multiple locations. The current record is 34,000 girls and are hoping that with your help, we can smash that record! 1. Join them in person at the Nickelodeon Suites Resort in Orlando on Nov. 15, 2014 from 7-10pm ET for the live party! They can book rooms now at 30% off standard rates by mentioning LalaPJParty when they make the reservation. To book a room, they should call 877-642-5111. 2. If you can’t join in Orlando, you can still enter for a chance to WIN an all expenses paid trip for two to the event by clicking http://woobox.com/bc35jj to enter. The contest closes on Monday 10/20, so enter quickly now! 3. And if you still can’t attend or didn’t win, you can still join on Facebook and Twitter on Nov. 15 from 7-10PM ET using #LalaPJParty. They will posting updates and photos from the event, and doing tons of product giveaways, fun craft activities, and hosting a Lalaloopsy movie viewing party (via Netflix) for those participating online. By the way, if you aren’t familiar with Lalaloopsy, it is the #1 collector brand for girls ages 2-11. The Lalaloopsy animated series airs on Nick Jr. Whether they are there in person, or participating online, we know this will be a really fun event for all families with girls. « 3D FIBER LASH MASCARA is the ultimate MASCARA! Ahhh, see this is where I am different. We are an all boy house, so it’s going to be trucks, dinosaurs and video games here. Those are adorable gifts! A friend of mine was telling me she’s already started Christmas shopping. I should start now, too, so that I’m not so stressed out at Christmas time! I have troubles coping with the whole Christmas stuff before Halloween gig! It’s a tad overwhelming. Don’t get me wrong… I love Christmas and have already started some preparations but it seems early for stores to take out merchandise. However, I love that little oven! 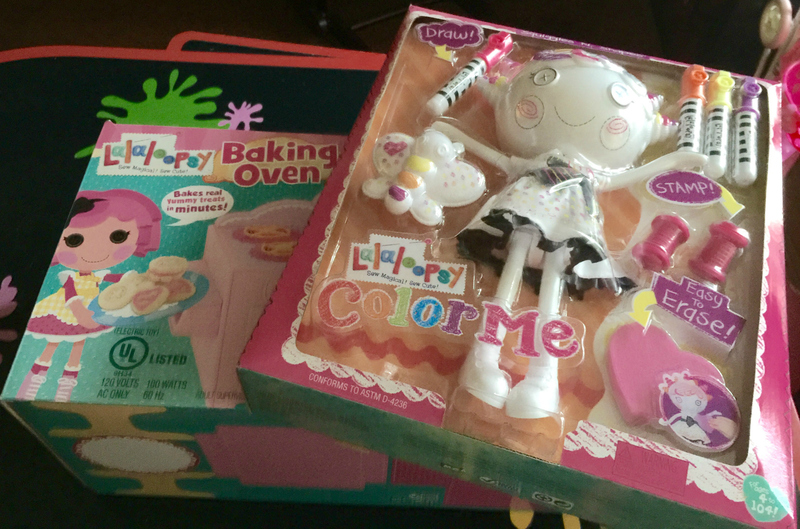 How cute (as a little girl, I loved my EZ bake oven but this looks so much easier. My youngest would love that doll. She has tried colouring on her dolls before. Oh my. Your wall – eeek! So glad you had the nail polish remover handy. I like that you are publishing this early before Christmas shopping begins. Very smart. Have a great Friday, Janine, and thank you. These are so cute! I always wanted one of those little ovens when I was a kid. I blame my lack of a kid’s oven for my inability to cook now. Just think how your daughters might become chefs one day. Or, at least, not have to live on Ramen when they are in college. Awww, cool! It’s like this gen’s version of the easy bake oven. Can’t wait for them to open it and I want to see what they bake. So cool that the drawings on the doll can be erased. Let them experiment with their creativity. Merry early Christmas :). I love that you are getting such a head start on your shopping. We have so little time with all the blogging demands. You encouraged me to take advantage of every opportunity we get to plan ahead. I truly believe when we plan ahead we are FAR LESS STRESSED. I love the toys you picked. They seem perfect for the girls. Have a great Friday my favorite day of the week. I get to go watch my son play football. My niece loves Lalaloopsy! I also saw a very “interesting” commercial for one of their dolls in which it leaves charms in its diaper??? What the ??? That is seriously crazy!! You remind me how far away I am from toys for Christmas like this. I don’t even know what Lalaloopsy is! It’s all clothes and electronics and art supplies on my girls’ lists now. Oh, and remote-control cars. Glad you got to unbox and play with the stuff first, Janine. That’s a good mama. I think my daughter would love one of those doddle dolls. I have been considering one for this year! Well, those things will not be in our home but I do have lots of nieces who might love them!!! I have a HUGE Lalaloopsy fan over here as well and I’m already getting the “I want that!” with every kid commercial that comes on TV. That baking oven and doll would be a huge hit with most kids I think and I can’t wait to hear about their excitement when they open their gifts. Here’s to a great weekend! I’m a little out of the toy loop. so I’ll admit that I’ve never heard of them before, but the doll that you can redecorate looks like a lot of fun! OMG Christmas is WAY too soon. It seems like just yesterday that we were complaining about last years’ snow days, and then the kids turning five… how is this time flying, Janine? Seriously? I love that you’re already getting a head start but really? Making me look bad. Tucker does tell me daily what he wants but omg I want a girl some days because we’re talking transformers, toy guns, blech. This looks like a lot of fun! Glad you’re one foot up on the girls Christmas list with the Lalaloopsy’s. The bake oven will keep them busy for sure! Was great to see you all. 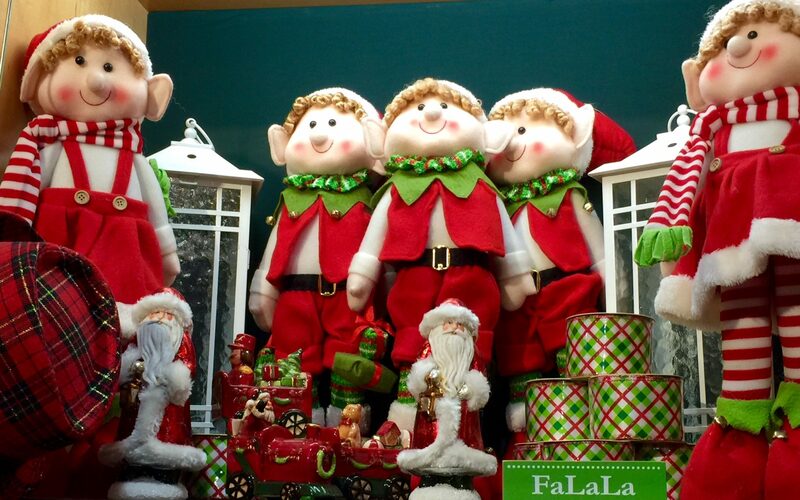 Love…..
My kids have been talking about their elf coming for A MONTH!!!! This looks SO cute!! And the picture of your girls? BREATHTAKING!!! And I literally LOLed at Emma’s name on the door! CLASSIC mom moment indeed!!! These gifts look SO perfect for the little girls!! Great timing- cause as you said- CHRISTMAS IS COMING FAST!!!! Can Scarlet come to your house for Christmas??? 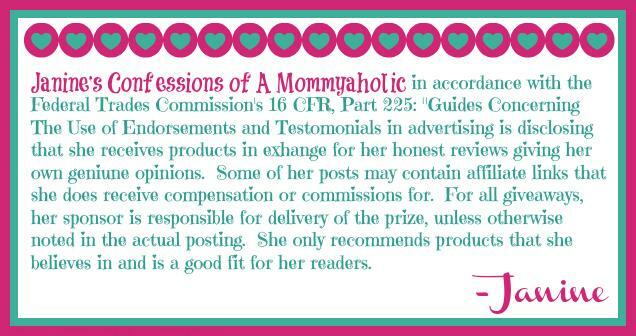 And I haven’t started Christmas shopping, much, (ok one gift) because I’m waiting on two paychecks from BlogHer that will post on November 15th (convenient, right?) but I’m already in the holiday mood. Which is nice because last year was the only year of my life in which it never hit me. I have no idea why and it was sad. This year, it already did. I think now that my sister’s wedding is over, it’s time to focus on the holidays because life is a bit calm enough now to do so. I love Christmas and the holidays, so bring it on 🙂 My girls would totally go crazy over these 2 items, thanks for sharing Janine! I don’t know which my kids would like more, the oven or the doll! I will have to add both to our holiday and birthday list. These are so cute. My daughter would go nuts for that doll. I want to get her one for Christmas. Thanks for the suggestions. I have a few girls in my life that would love this lalaloopsy stuff!! I think I am going to get them the oven! I remember having one as a kid and it was awesome! I totally wish I could go to the pajama party too 🙂 sounds like so much fun!